Here on the east coast of Australia we have entered the ‘windy months’ of August and September. We’re nearing the end of winter and the beginning of spring, and the air is dry, which has an effect on our skin and even our moods. As a mirror-image, the northern hemisphere is entering the dryer, cooler autumn months. This means it’s time to take extra care of our ‘vata’. Vata is the Ayurvedic constitution associated with air and ether and if we have too much of it not only can our skin feel dry but we can be more prone to anxiety, insomnia and ‘flightiness’. It can be helpful to ‘ground’ this vata energy with some nourishing daily yoga and Ayurvedic rituals. A regular practice of a pawanmuktasana (joint-freeing, vata-reducing) yoga sequence as well as the delicious practice of Ayurvedic self massage can be just what the doctor ordered. Ayurvedic self-massage involves lovingly massaging yourself with a warm oil and can be a boon to women. Shiva Rea enthuses that massage of warm oil on the body is ‘one of the most nourishing, life-enhancing gifts of health you can give yourself for the rest of your life.’ I particularly love it as a healing and balancing practice for perimenopause (the turbulent years leading up to menopause). Ayurvedic oil massage works on a deep level to lubricate the joints. This has a powerfully healing effect on the typical dryness and stiffness of the joints, and depletion of the energy, characteristic of a person with high vata, and which naturally occur as women age. The warm sesame oil also moisturises dry and/or mature skin and, as you sit in meditation or contemplation for the 10 minutes or so while the oil soaks in, you can actually feel your nervous system being calmed and nourished. After a long hiatus I have just taken up this practice again as the spring winds whistle outside and it feels so good! Try it yourself! There are two important points for this daily self-massage technique. First, make sure you use cold pressed black sesame oil, available from health food stores and Ayurvedic suppliers—not the Chinese sesame oil you use for cooking. You can also get medicated black sesame oil that is infused with herbs to correct a particular imbalance in any of the doshas—vata, pitta or kapha. The second important point is that you warm the oil, as explained below. If you are doing this practice in the colder seasons, start by heating the space where you will be doing your self-massage – usually your bathroom. Then, spread a large, old towel down on the floor. Place a small bowl or cup of the black sesame oil within another larger bowl of boiling water to gently warm the oil. Take your clothes off and sit down to begin the massage. Take a few deep breaths to calm and ground yourself before you begin. Then, start by massaging the oil onto your feet—the soles then the tops of the feet and the toes. With long, flowing strokes, work your way up the legs to the outer hips and buttocks. Keep working up the body—with circular motions on your belly (always in a clockwise direction), into the sacrum, lower back and kidney area, on and around each of the breasts; and sweeping from the backs of the shoulders to the front, pectoral muscles and across the collar-bones. Then, work your way up the arms, from the palms of the hands and fingers and up into the armpits. For the larger muscles and joints, use circular, sweeping motions with the palms—in an upward direction towards your heart. Pay particular attention to working into the major joints—ankles, knees, hips, wrists, elbows, shoulders. For the soles of the feet, you can use your thumbs and fists as you massage into the insteps. Likewise, for the palms of the hands—use the fingers and thumbs and work into each finger joint as well as massaging into the palms. Finish by massaging the face—focusing on any tense areas like the hinge joint of the jaw and eyebrow-centre—and using small circular motions with one or two fingers. Lastly, if you’re planning to wash your hair, use a little of the oil to massage an Ayurvedic Marma Point on the very crown of your head with the tip of one or two fingers. Locate this point by measuring about eight of your finger-widths up from the eyebrow centre. This is an important ‘stress-release point’. Conclude your massage with vigorous, heating rubbing motions with the palms of the hands up and down the thighs. Wrap yourself up in an old towel or cuddly dressing gown and step into some old socks or slippers to protect your floors and carpets from the oil. Now it is time to for the oil to soak in and do its magic for about 10–15 minutes. If you have the time, sit quietly in meditation or do some gentle Pranayama. Sometimes, I like to just sit in the morning sun with a cup of tea, thinking, breathing and doing nothing in particular; taking pause at the beginning of my day. If you are too busy to stop and need to get yourself or family members ready for school or work, that’s fine too! I’ve sometimes made my son breakfast whilst wrapped up in my oil-dressing gown. At least 10 minutes later, or when you’re ready, take a hot shower to wash the oil off and complete your morning ablutions. As you wash the oil off, you can imagine you are sloughing off anything that is no longer serving you. I also like to imagine that when I do my oil massage I have created a kind of magical, good-vibes ‘force-field’ around me that sets me up for the day and keeps the ‘good energy’ in and any ‘bad energy’ out as I go about my day and interact with others. This is an excerpt from Ana Davis’s book Moving with the Moon: Nurturing Yoga, Movement and Mediation for Every Phase of your Menstrual Cycle and Beyond. Ana Davis has long been passionate about exploring the benefits of yoga and meditation for women’s monthly and life cycles. 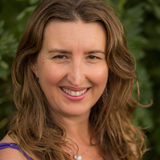 Ana has been teaching yoga since 1996, and in 2005 founded Bliss Baby Yoga – offering specialised yoga teacher training courses in the areas of Prenatal, Postnatal, Restorative and Women’s Yoga. In 2013, Ana also founded Moving with the Moon which offers workshops and classes on yoga for the menstrual cycle, menopause and fertility. Ana's first book, "Moving with the Moon: Nurturing Yoga, Movement and Meditation for Every Phase of the Menstrual Cycle and Beyond" was released in October 2018. Restoring Balance: Restorative Yoga and Yin Yoga – what’s the difference?